Description: PDPU invited for Jr. Research Fellow Posts under various projects. 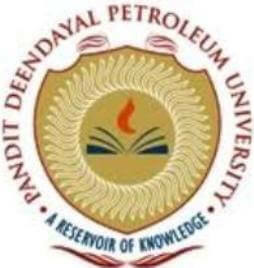 Pandit Deendayal Petroleum University - PDPU published an official notification for Recruitment of Jr. Research Fellow for 02 posts. Eligible candidates can apply for this recruitment. You can view more details about this recruitment including No. of posts, name of post, Educational qualification, Age limit, Selection process, How to apply etc... You can also view official notification and other important facts about this recruitment e.g. Important links and Important dates. M.Sc. in one of the following subjects -Physics, Space Sciences, Atmospheric Sciences, Environmental sciences, Geophysics and Climate sciences or related discipline with 1 year of experience with NET/ GATE qualification. The candidate must have taken Physics and Mathematics at the Under Graduate Level. A minimum of 60% marks at Bachelor’s and master’s level are required for all candidates.